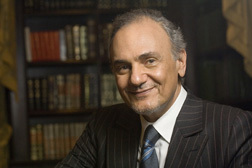 His Royal Highness Prince Turki Al-Faisal served as the Ambassador of the Kingdom of Saudi Arabia to the United States of America from September 13, 2005 until February 2, 2007. In 2005, Prince Turki was appointed Ambassador to the United States on July 20, 2005. He presented a copy of his credentials to Secretary of State Condoleezza Rice in New York City on September 12, 2005. Prince Turki presented his credentials to President George W. Bush at the White House on December 2, 2005. He served as Ambassador to the United States until February 2, 2007.